By the time September rolls around I’m so desperate for it to be Fall that I decorated my house with pumpkins and leaves on Labor Day. And, when summer is stubborn and lasts interminably into late September, I’ve been known to turn up the air conditioner to chill the house and break out every bit of fall produce I can lay hands on. For a few days toward the end of September I was pretty sure I was going to have to do that this year because it had been just plain hot her in good ol’ Texas far far into September of this year. Happily, Mother Nature came to my rescue just in time and has blessed us with cooler weather and the autumn weather is in full swing (such as it is in Texas of course). In celebration of the glory of fall, I declare it to be Fall Favorites month on the blog. There will be pumpkin recipes, squash recipes, apple recipes, and for good measure some pork loin and possibly some chili thrown in for good measure. I’ll be wallowing in all food goodness and I hope you’ll not only indulge me, but join in. 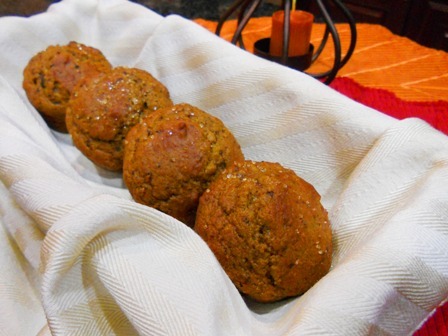 To start the month, I offer this recipe for Pumpkin Walnut Muffins. I love to keep my freezer stocked with healthy muffins for quick and easy breakfasts during the week and I wanted something more fallish to add to the collection. It’s not quite time for fresh cranberries, so I turned to my good friend pumpkin. I found a great recipe on the My Recipes site, but of course couldn’t resist tinkering with it. The result is a muffin with a bit of whole grain flour mixed in for good measure and walnuts for-some additional healthy fat. Brown sugar adds moisture as does a bit of Greek yogurt. The result is a moist and rich muffin perfect for any fall morning. Spray a muffin tin with the cooking spray. Combine the flours, baking soda, baking powder, cinnamon, cloves, nutmeg, and salt in a medium bowl and whisk to combine. Combine the sugar, pumpkin, buttermilk, honey, yogurt, and egg in the bowl of a stand mixer and mix with the paddle attachment until well combined, about 3 minutes. Add the flour mixture in three parts mixing just to combine after each addition. Be careful not to over mix. Add the walnuts to the bowl and mix briefly to fold them into the mix. Spoon the batter into the prepared muffin tin. Bake for 20-25 minutes or until the tops of the muffins spring back when pressed lightly in the center. Remove the pan from the oven and place on a cooking rack for five minutes. Remove the muffins from the pan and let cool completely. You can use canned pumpkin or fresh roasted pumpkin for this recipe. There’s something special about freshly roasted sugar pumpkin but good organic canned pumpkin works just as well. You can easily substitute other nuts or even dried fruits for the walnuts. These muffins freeze beautifully. Wrap them in aluminum foil and place in a zip top bag. Reheat frozen muffins for 20 minutes in a 400 degree oven. I will certainly be making these this weekend-thank you. Oh and a very happy Fall to you.